Canine Labs 1-4 in one package. Are you uncomfortable handling large, hyperactive, or seemingly aggressive dogs? Did you know that if you’re unaware of how the dog perceives every interaction, you could be giving unclear or conflicting cues, which can cause him to become confused, fearful, and even aggressive? 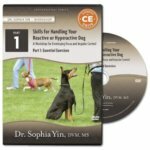 Learn the Low Stress Handling® technique that will allow you to provide clear direction and hence have good control to improve both your confidence in handling and the dog’s confidence in you. Have you ever had to struggle to get a dog into a position or keep him there for an exam or procedure? We often use force to restrain uncooperative dogs when techniques that incorporate finesse would work better. With Low Stress Handling® techniques you learn how to control movement in all direction while the support and guidance the dog needs to feel secure. Many dogs dislike or are fearful of various types of handling for procedures such as toenail trims, injections, and venipuncture. While it may seem faster to use force-restraint, this type of handling frequently makes the patient worse and takes more time. Techniques for training dogs to enjoy procedures are straightforward, but there are important nuances. In the fourth lab of this Master Class Collection, you’ll learn the detailed steps that will lead to quick and efficient success. Your patients will now be happy and your clients will be, too. 1.Recognize how every interaction – even how you guide the animal from place to place – affects the animal’s perception of you, his level of fear and frustration, and his willingness to cooperate. 2.Practice exercises that will teach you how subtle differences in posture, speed and direction of movement dramatically affect your ability to provide clear direction. 3.Learn how to skillfully move dogs into position in a way that gives clear guidance, thereby increasing the dog’s confidence in you and decreasing his confusion and anxiety. 4.Understand how to control movement of the dog’s front and rear ends in all 6 directions (front, back, right, left, up, and down). Determine which of these directions each hold controls and when to use a minimal vs. a maximal restraint hold. 5.Learn how to safely get into position to restrain a dog and identify the common mistakes people make during this transition that increase their risk of being bitten. 6.Discover how guiding dogs through position changes (including standing to lateral) in a secure and well-supported manner can change a dog from being resistant and even aggressive to being calm and cooperative. 7.Learn 5 methods for controlling the rear end and 7 methods for controlling movement of the front end. Determine which directions (front, back, left, right, up, and down) each hold controls, and practice adapting to the dog’s movement by switching between holds. 8.Discover how to safely pick up small dogs who are friendly, but wiggly, as well as those who are aggressive. 9.Evaluate which restraint hold is best for a given dog and procedure. Know how to determine, based on the dog’s body language and behavior, when to choose something else. 10.Learn how to train a dog to enjoy toenail trims, injections, muzzles or head collars, and almost any procedure that he previously disliked. 11.Discover how subtle differences in timing, treat placement, choice of a motivator, food delivery technique, and the ability to define appropriate criteria can make a vast difference in the effectiveness and efficiency of your training. 12.Learn how to increase the likelihood that a dog is motivated by the food that you are using. Discover how you can desensitize and counter-condition using motivators other than food. 13.Recognize when you’re performing the techniques correctly, how to avoid common mistakes and when to make modifications. All 4 Canine Labs for only $199.00. Save $56!